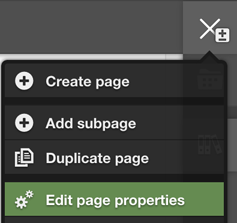 Pages and widgets may have properties that cannot be seen or altered directly on the page being edited. If, for example, it is optional to have a breadcrumb navigation at the top of a page, you as an editor should be given a means to switch this navigation on or off. Web developers usually make such options available on the page or widget properties dialog. You can open this dialog using the menu behind the widget handle or, respectively, the page icon. The properties of a widget like the ones shown here for a Button Widget often include display options, e.g. colors, embedding, alignment or widths, but also data that cannot be entered in place: the address to show on a Google map, the link an image points to, etc. Web developers can make almost any desired behavior of a widget configurable on its property view. Page properties refer to – you guessed it – the page as a whole. If provided by the website developer, the page properties, as do widget properties, include display or layout options. But the main focus usually lies on meta aspects such as good findability. So, tagging and assigning proper keywords may be relevant – in the context of your site search, but also with respect to search engines and social media, if you have something to say or wish to attract potential customers. You can edit various types of content, in place on the pages themselves, or on property dialogs. There is a dedicated editor for every type of content Scrivito supports out of the box, e.g. for single or multiline text, images, permalinks, single or multiple selection options, etc. On the screenshot above, the permalink editor, two single line input fields and a multiple selection editor can be seen. Note that some of the built-in editors are not suitable for WYSIWYG editing (e.g. the “linklist” editor or the “enum” editor) because in order to utilize them, their editing controls need to be always visible. This is why a ”linklist” editor or a background color selector is preferably made available on a property dialog of a widget or a page. All of the built-in editors can be used intuitively: Click anywhere inside a text box and start typing, or click an image to select a different one using the Content Browser. With some editors, however, their potential isn't obvious at first sight, so a few explanatory words might be useful. All changes you make using the Scrivito editors are saved automatically in the background. The only exception to this rule are editors that require validation which currently applies to the permalink editor only. Scrivito includes a text editor for formatting pieces of text in-place and at the click of a button. Simply select the text you want to format or link. This causes the formatting bar to show up. Choose the styles you want, then click inside the text again to continue writing. For creating a link, select the text to be linked, then click the chain button on the formatting bar and enter or paste the target URL into the input field that appears. Click the folder button to the left to locate the link target using the Content Browser. New in 1.6.0 Optionally, click the gear icon for specifying the link's rel attribute values. Link lists are primarily meant for maintaining “see also” (“further reading”, “you might also like”, etc.) links. If a developer has equipped a page type with a linklist attribute and made it editable on the page properties dialog, you'll see the link list editor there. It lets you add, sort, and remove internal or external (off-site) links. You can use the Content Browser to select an internal link target (an object part of the site content) after clicking the search button (magnifying glass). Each link in a link list consists of a title and a URL. Omitting the title of an internal link usually causes the title of the linked CMS object to be used. As an alternative to link lists, reference lists can be used. The latter are restricted to pointing to CMS objects, which is often sufficient and makes them a bit easier to use. The string list editor is ideal for collecting words, short phrases, names etc. and assigning them to a page, an image, or any other kind of CMS object. The editor suppresses duplicates and supports auto-completion which helps to avoid misspelt items, making it the best choice for editing tags. Since the string list editor supports phrases, hitting the space key does not complete an item or separate it from the next one. Please use the tab or enter key instead.